Conventional wisdom on the safest place in the car for a child to ride has changed in the past few decades. It is now generally understood that young children should ride in the back seat. 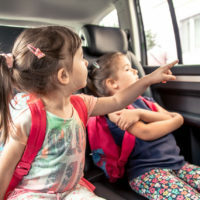 However, several lawsuits in recent years have uncovered defects in car seat backs that pose serious risk of personal injury to children and adults alike who ride in the back seat. Mercedes-Benz just issued a recall for over 22,000 cars and convertibles due to faulty seat locks. Auto manufacturers who continue to use faulty seat back designs or who allow defective seat backs to be installed in their vehicles may be held liable for any injuries their defective products cause. In the last few years, there have been hundreds of injuries and even deaths caused by defects in car seat backs. These incidents have yielded several large lawsuits, but auto manufacturers do not appear to be doing anything to fix the problem, leaving these dangerous seat backs in cars around the country. When an accident occurs, passengers will continue to travel forward. That is the reason behind airbags and seatbelts. For the safety of passengers in the back seats, car seats are supposed to be able to withstand sudden impact and remain upright and intact. Unfortunately, many of the seats installed in common consumer cars have been known to unexpectedly fail, break, detach, or collapse upon impact if the they were defectively manufactured or installed. If a seat back fails, serious injury can result. Most commonly, rear passengers can be trapped or crushed by the weight of the front seat or the passenger, which results in blunt force trauma to the head and body. Passengers may also be ejected from the vehicle or cause the driver to lose control and exacerbate the accident. Detached car seats also can suddenly become dangerous projectiles flying through the air. As mentioned, Mercedes-Benz recently issued a recall of 22,637 cars because the front seats might not lock into place as expected, folding forward in a crash and increasing the risk of injury. Ford likewise issued a recall this January due to a seat back problem which could have caused seats to break during a crash, following its 2017 recall of 2,200 SUVs for the same welding issue. Honda recalled 800,000 Odyssey minivans in November 2018 after it came out that the seats were latched improperly and could tip forward. Many other manufacturers including Mercury, Tesla, Audi, and Toyota have issued similar recalls in recent years. If you or a loved one has been hurt by a defective car seat back in Vancouver or Portland, you may be entitled to compensation for your damages. An experienced product defect lawyer can help you obtain the recovery you deserve. In Vancouver, Washington and Portland, Oregon, call attorney John Lutgens at 360-693-2119 for a free consultation.